How Vacation Bible School Has Changed! How Satisfying Is Your Life? Happy 5th Gotcha Day, Spunky Doodle! What do you wish was never invented? Do You Appreciate The Beauty Around You? Excitement To Start Off The Day--Happy Fourth! How Do You Decide What To Read Next? When I took Abby for a morning walk Tuesday, I saw there were "No Dog Allowed" signs up at the park where we always to to walk her. This is sad. 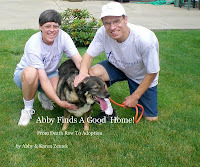 Check out Abby's post about it at Abby's Blog. Below is a video about our morning walk. Judy Liked My Funny Dad, Harry! Oh my goodness...YES...I loved it! It reminded me of some of the times I had with my mother while she was living with us...sometimes frustrating, but always with love and affection.
. I was sorry to hear she had shoulder surgery and lots of painful therapy ahead so that's why she hasn't written a review yet, but sill when she is able to type better again. For those who clean floors the old fashioned way of getting down on your hands and knees like my husband does, I discovered a tip that saves your knees and back at Proverbs Wife. She suggests using a broom dipped in hot water and then wiping the floor dry with a rag using your foot. Check out her post for further details. When reading A Book Inside I learned that the highest Page Rank is a 5, not 10 like I thought so my 3 is better than I thought! Yippee! I learned Tuesday when I went for a core biopsy, that all I needed was a cystic aspiration in my right breast which was painless since they numbed the area and I could watch the ultrasound picture on the screen as the doctor poked the cyst with a needle. The doctor removed the fluid that collected and will have it analyzed. All the nurses and technicians were very nice to me and the doctor was super at Parma Community Hospital. I won't get the results until my follow-up appointment August 17 (my doctor is on vacation). I never heard of such a thing until last Tuesday when I had one done at Parma Community Hospital. Apparently, a couple cysts showed up on my mammogram and so a biopsy was ordered as a follow-up measure before they knew for sure. Biopsy is a scary word because it's connected with cancer and I never had anything like that before. When I went, the doctor said she was going to try an asperation first and then if she didn't get anything, would then do the the ultrasound core biopsy. The cyst aspiration was really painless and I had very nice nurses, technicians and doctor who did a great job at getting me to relax by discussing books, including the one I wrote, and my vacation. First, they brought me a very nice lightweight blanket that felt like it had just come out of a microwave. The room was a bit cool so it felt very good. The one nurse mentioned that I'm very organized which made me feel good. Everyone who knows me agrees that I am an organized person but wondered how she knew. She was very observant, noticing I came prepared with a book to read while waiting and a folder with all my doctor orders in it and a list of my medication. Then they arranged me so I could see the ultrasound picture as the doctor poked the needle into the cysts and removed fluid which will be analyzed to see what type of cells is in it. I could also see the clock now which I was happy about. They numbed the area so I really didn't feel any pain at all, just some pressure. It hurt way more when I got hit with the softball on my leg. One of the nurses even brought me some cookies when it was over. I didn't eat a big lunch because the brochure I got said not to so I was pretty hungry by 2:45 p.m. The procedure was a success but afterward the doctor thought there may be a third area to look at so ordered another mammogram. I didn't understand how they could do a mammogram without busting open my bandaged area but they did and it was just a little uncomfortable but didn't really hurt. The technology was amazing to me. I won't really know the results until my other surgeon gets back from vacation so made the follow-up appointment for August 17. Thanks for making this scary experience very pleasant Paula, Airy and Dr. Hollier. Now I wait some more. This is the shirt I usually wear when going to see a doctor because I hate waiting and wasting my time off at a doctor's office. This trip took me 2.75 hours and I knew my husband was anxious for some news. 29. Flip through your calendar and look at the pictures. 30. Count the days until your next vacation. 32. Make a spreadsheet to keep track of your spending each month. 33. Empty your recycle wastebasket. 34. Go for an elevator ride. 35. Check out what’s available in the vending machine. 37. Drink some of that water you brought to your desk. 38. Help out someone else. 39. If your place of employment offers tutorials or classes, sign up for some and attend. 40. Make more room in your file drawers by sending your old files to the record center. 41. Add some speed dial numbers to your phone. 42. Look out the window. 43. Just stand up for awhile. 44. See how many scripture verses you can write from memory. 46. Rearrange the icons on your desktop. 47. Change your screen saver picture if allowed. 48. Look through the coupons in the phone book to see if there are any you could use. 50. Make a file index of the files in your filing cabinets. 51. Read your company’s Intranet page if they have one. 52. If you have ring tone choices on your phone, change them. 53. When delivering something to someone interoffice, take the scenic route back to your desk and be sure to use the stairs. 54. Finally, last but certainly not least, read that policy and procedure manual! Do you have any other suggestions? Which idea do you like best? How many have you actually done? Me, I have actually done 45 of these things. The rest I just thought of when making this list! First, I’ll mention three things you definitely should NOT do at work: blog, sleep, browse the Internet, or do social networking--these are No-Nos. 1. Get some water to keep at your desk. 3. Look through your files. 4. Take some files out of the drawer and put them on your desk. 5. Take a walk to other floors via the stairs. 7. Mark and decorate vacation days on your calendar. 9. Think of a word and other synonyms and then look it up using the Thesaurus feature on your computer to see how many you matched. 11. Call home and leave a message on the answering machine for your family our pets. 12. Read a book (but only if you’re allowed). 13. Play a handheld video game with the sound muted under your desk. 14. Make a PowerPoint just for fun. 16. Write a letter to someone or an email. 17. Schedule more vacation days but check to see how many you have left first! 18. Make a Doctor appointment for a routine checkup. 19. Rearrange the things on your desk. 20. Memorize some scripture verses. 21. Take all the breaks you are allowed and move away from your desk—go for a walk. 22. Mix up your alphabetized files and then put them back in order. 23. Go get some more supplies to stock up to be prepared for when you do get busy. 24. Make some lists (blog post ideas, things to do to look busy, things to do at home, home improvements you would like to make some day, etc.). 25. Exercise in an empty office. 26. Start writing that book you always wanted to write but put those headphones on from the dictating unit. 27. Wash your hands—use the hand sanitizer. Check back tomorrow for Part 2 with some more brilliant suggestions! Which one of these is your favorite? Although this video doesn't show it, we also had songs that went along with teaching the memory verses for the week which were I John 3:1 (Jesus accepts us), Isaiah 41:13 (Jesus protects us), Romans 10:10 (Jesus saves us) Psalm 86:5 (Jesus forgives us) and Ephesians 2:10 (Live for Jesus.) Crafts consisted of a journal, verse plaques sponge painting a t-shirt and a necklace. The kids had homemade cookies for a snack each day, rec time outside, and prizes. In grades 4-6 they got tickets for attending, bringing a Bible, saying the verse, bringing someone new, etc. and at the end each day if their number was called, they got to choose a prize. The last day everyone got a chance to choose something. Of course, we had teams competing for points all week. We had over 130 kids in just grades 4-6. Thursday and Friday we had 800 kids attend! That's the most we ever had! This is very different from when I was a kid. I remember the whole Bible School had only about 100 kids. We had paper crafts except for one year I remember we made a sundial which I liked. We didn't have any outside time except for the one I went to with a friend one year. They had a snack the last day outside. As a kid, I really wasn't big on going to VBS. One year I remember there was about seven or eight of us in a class and we had a real old lady for a teacher who told us we couldn't leave until we said the verse. Most of the years I went as a kid were no fun at all and it almost turned me off memorizing scripture. The worst part was we had to dress up for it. It's so much better now allowing the kids to come in shorts or jeans. Only one year I really enjoyed it and that was when I was I finished 6th grade and the couple in charge of our group actually tried to make it fun and interesting. We got to play tic-tac-toe! Whoopee! That was exciting back then compared to what we were used to. I can't remember ever having a skit growing up. The worst year was when we had the Pastor as our teacher and I finally got my best friend to come. That week, all our lessons were all about the denomination and nothing about salvation the entire week! I was so mad and disappointed! When I had the opportunity to run the Vacation Bible School a couple years at the Brooklyn Christian & Missionary Alliance Church, I had team competition, one key verse for the week, a softball game in the afternoon between the teams, quizzing between the teams and crafts that the kids had a choice of which to ones they wanted to make and gave out candy. What are some of your memories of VBS? Do you think kids have it better now than we did growing up? I sure do! * They like to eat twigs. * They are fiercely protective of their young. * They grow new antlers every summer. * They can kick in all directions. * They can swim up to 6 mph and ten miles without stopping. When reading Just a Thought, I learned that on an island off Africa, in order to help with the overpopulation of dogs and cats they are feeding them to sharks! This horrified me to think of this. The article about it is at National Geographic News. In the CLEVELAND PLAIN DEALER I read that the government of China has blocked out popular social networking sites like Facebook and Twitter. Glad I don't live in China. After updating my Firefox browser to 3.5 I found out that the Entrecard Toolbar is not compatible with it so now I lost it. It takes much longer to do EC drops now and I miss not having the advertising button, and seeing the number of drops I did all on the toolbar. Also miss not being able to drop on my favorites quickly anymore. If I want to drop on my favorites now, I have to do it through my Entrecard page and clicking on them takes me to the profile and not the site so that's two clicks now to get there--forget that! I sure hope they will fix this somehow to work with the updated version of Firefox. I contacted Firefox through their support and was told it's an Entrecard issue. Hmpf! You live a satisfying life even when it's not easy. You are dedicated to being happy. You make sure to what you're passionate about. You don't waste any moments. You surround yourself with people you cherish. There is a lot of love in your life. You are thankful for everything you have. You don't take anything for granted. We have a very good vet who gives a multi-cat discount but is bout half an hour's drive away and always has a full waiting room. You have to call about a month ahead to get an appointment there too and the whole reason we went there was because Dr. Hart is so nice. That's the vet who saved our Moe by getting him to eat on his own again after force feeding him at her own house for a week! The last few times we went though, we didn't get her so we decided to look for a closer vet to cut down on the stress to our kitties. We decided to try the Broadview Bird and Animal Hospital. Abby seemed to like it and did quite well. She was a hit with everyone except for one little growly dog that kept growling at her. There were a lot of birds--big colorful parrots! Abby didn't express any interest in any of them. We got a 3-month supply of heartworm medicine and some "greenies" that she liked to keep her teeth in good shape. The vet gave her a small biscuit treat too so she was happy, wagging her tail with the dental chew in her mouth as she left. She also lost some weight since we got her going from 55 pounds to 48 so that was good too. We were told to just keep doing what we're doing. 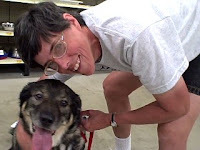 Abby wrote about her vet visit in her Dogster Diary at "My Trip To The Vet Was Fun. Yesterday it was the cats' turn. 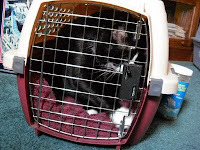 Manny decided he wasn't going and I could not get him into the carrier so just took Spunky Doodle and off we went. I am actually glad Manny didn't come because the vet said it wasn't necessary for him to come since the annual shot wasn't that important and he still had two years left on his rabies shot. Whew! He saved me $97! Yes, the wellness exam, stool analysis and the annual shot for Spunky Doodle came to $97.00! Oh, and the exam involved petting Spunky, and looking at her ears. I don't recall her even checking her teeth but was happy she said I didn't have to bring Manny. Of course, he wrote about this on his blog at "No, No, I Wont Go!" which you might enjoy read. I did a price comparison with another vet place nearby and it came out the same but they didn't even have the heartworm medicine there but said they could order it. Maybe we'll be sticking with Dr. Hart after all. I have one more area one I'd like to check out first. What a hassle!! He invited two women who have had abortions to come and share their story of how they found forgiveness when they attended a HEART workshop and it was very interesting! First though, he made the point that in God’s eyes, sin is sin and all sin separates us from God, whether it’s just a lie or a murder. This is based on lists of sins found in Galatians 5:19 and also in Proverbs 6:16-19. Pastor Dan pointed out that abortion is a sin because life begins in the womb as indicated in Psalm 139:13-14. “Do not kill” is one of the commandments (Exodus 20:13). The penalty for sin is death, eternal separation from God but the gift of God is life through God’s Son, Jesus. Jesus died for everyone while we were still sinners and paid that price. If we accept Christ death on the cross was for us and repent of our sin, we can be forgiven! These women shared that they felt guilty after the abortion and participated in self-destructive behavior such as drugs, alcohol, divorce and even attempted suicide which are all common among women who have abortions. The one woman got actively involved in pro choice in order to help herself feel better. Both these women had a hard time forgiving themselves for aborting their babies. Both had different reasons. One did it because after her first baby, she just didn’t want to go through the pain of having another so aborted her second child. The other woman who shared was from a troubled home and looked for love in the wrong places. When she got pregnant with a man’s child who she did not love, she did not want to keep the baby because she didn’t think she could love it. These women explained that most keep the fact they had an abortion to as few people as possible and really don’t want anyone to find out about it. That is why this workshop is strictly confidential. If you had an abortion and feel your life is messed up and there’s no hope, give the Cleveland Pregnancy Center a call at 440-243-2520 and just ask about the HEART workshop. There is forgiveness and help for you available. I hope this post will help someone find it. Pastor Dan of Parma Heights Baptist Church is preaching on tough questions submitted to him by members of our congregation for the summer. I thought this was a great idea and submitted a couple of my own (this one wasn't mine if you're wondering). Most likely, I'll post summaries each week on my Zemeks' Updates blog under either the "Parma Heights Baptist Church" or "Life Is Tough but God Is Good" sections. Only the exceptionally good ones will make it to this blog. Yep, bones should be banned from the bedroom! Sadie only gets bones in the morning so that she's hopefully done with them by night. And she loves her Kong too. We put dog biscuits in it and then put the peanut butter in it so she gets "surprises" after licking through that peanut butter. It'll keep her busy for quite awhile and she'll even start tossing it in the air since she knows that when it falls the dog biscuits will break and fall out. I tried putting in the treats with the peanut butter as you suggested and that made all the difference! Take a look at this video of Abby with her Kong now. I take away bones at night too or I'd hear chomp, chomp all night so I sympathize. If she didn't like peanut butter in the Kong, you can try sticking a biscuit in there or my favorite thing was Cheez Whiz. If Abby discovers she likes her Kong, you can put peanut butter, Cheeze Whiz or cottage cheese inside it, stick it in the freezer and then give it to her. The frozen treats inside the Kong will make it last longer. On Do You Appreciate the Beauty Around You? I learned many years ago to always stop and smell the roses. I take nothing for granted. I think that comes with age though. It did for me anyway. When reading Mountain Man Mondays, What's That In Your Hand I found out that birds like grape jelly! I also found out that woodpeckers like to eat upside down! When we played softball last Saturday, I picked up this tip from the opposing team. Their pitcher was having trouble finding the "handle" on a slow rolling ball and not facing first base but heard the first baseman yelling to him. I overheard him say after the inning that hearing her voice helped him to know where to throw the ball and was able to get our runner out. Since I play first, this is a tip I tucked away. I discovered this great site for tennis players: www.tennis.com/yourgame. It has a lot of instruction in forms of articles, videos and a whole archive to "Tips of the Week." I finally got around to loading the photo loader software and reading the manual for my digital camera while on vacation this week. I learned how to add audio to a photo. I can play it on the computer but don't know how to upload it here. I also found out I can crop and resize pictures right on the camera! There's also a feature to take movies and upload them directly to YouTube but I haven't decided if I want to do that yet. I'd have to install more software and don't want it messing up my Flip stuff. Does anyone have any experience with this? Today is Spunky's 5th "Gotcha" Day. That 5 years went by quickly and she grew pretty fast. I still remember when I could pick her up in one hand with no problem. Now she weighs in at 13 lbs. and doesn't usually want to be picked up. She's still a black beauty though and such a cutey. She wanted to be friends with our first cat, Moe, when we first got her and then quickly made friends with Manny when we brought him in. Now she has welcomed Abby into our family as well. She came around pretty quickly to accept her as a new addition to our family. Spunky is not as active as she was as a kitten, but has become very good at starring in videos and still seems to like her picture taken. I love how she'll sleep on the bed with me close by enough for me to pet her on and off during the night. I am so glad I brought her in as a kitten from being born feral at my dad's in May of 2004. 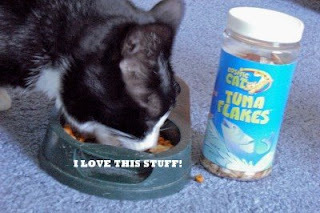 The one sure way to get her to come is to open up those Tuna Flakes. They are flakes that you just sprinkle on top of her food. She loves it and always comes right away as soon as I put some out for her. Manny, however, doesn't care for them at all. 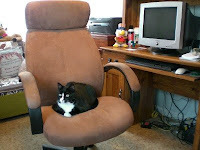 Read about Spunky's perspective at her blog at Zemek's Updates. I Can't Sleep! No More Bones Allowed In the Bedroom! Saturday we got another Rawhide bone for Abby which she loves! Unfortunately, she didn't just chew on it when we were gone, but even at night in our bedroom no less. I was pumped anyhow from our softball game and it was late so I just wanted to get to bed. Abby was making so much noise with this bone that I couldn't sleep! For two hours straight, she was chewing on it so I didn't get to sleep until after midnight! This is a picture of the bone Sunday morning. She did all that in just one day! Once she is occupied with it, you better not try taking it away or she'll bark at you like I found out earlier that evening. That morning I made a declaration that no more bones are allowed in the bedroom. We also got her a toy that you can put some peanut butter inside. I forget the name of this thing--Klong, or Kong, something like that. Anyhow, I really thought she'd love it but she was slow to go for it and only licks it if I hold it for her. Spunky, our inspector, went up to it thinking it was something for her and was disappointed to find out it was for Abby. When I think about all the things we have in today’s world, most I am thankful for. Two things come to mind though that we could easily do without. I wish guns and bullets were never invented! They make it way too easy to kill someone. Almost everyday in the news I hear about people getting shot, some by accident and some intentionally. June 19th I read about a 38-yr.-old women employed at a laundry mat that was robbed and fatally shot in the head. I would not want any in my house; they make me nervous. I am even uneasy around security guards or policemen who carry them. I love summer mornings and last Thursday, it was finally pretty warm when I went to work like it should be for July! It was such a pretty morning that I got off the bus a few stops early and took a 15-minute walk up Euclid Avenue to work in downtown Cleveland, taking pictures along the way of some sites I see just about every day only this time, I took my time and appreciated my surroundings. Among the things I saw were beautiful flowers, the Soldiers and Sailors monument, pretty blue sky, the Terminal Tower which at one time used to be the tallest building around, a double bus that I finally got a picture of, some sidewalk art, a fish pond with a little water fall and beautiful flowers. Enjoy the pictures in this slide show. What are you surrounded by every day that you just take for granted? I came across this video of Adam Bender on It's Okay to be Weird and just had to share it with my readers too. To read about our church co-ed softball tournament games, go to my Zemeks' Updates blog at Our Co-Ed Softball Team Hangs On--We're Still In It. Thanks to all those who commented this past week. I thought it interesting that the Entrecard Strikes Again Post got so many comments moving this post into first place as my most popular post ever so far! It even brought out some first-time commenters! I don't care about bounce rate, either. It seems like there is a constant stream of half-thought-out changes rolled out before the earlier changes and problems have been ironed out. Entrecard has been making some really bad decisions lately. It seems like they are on a mad rush trying to make money but they have no idea how to do it. All of the failed attempts have cost them respect from members. They have even cost them some members. I was really upset when the blog stated the new idea of giving points to nonbloggers for reading blogs. The idea did not upset me. I just thought it was a stupid idea. What upset me was that the blog post asked for feedback and spirited discussion. I made two comments to that post. The first one was deleted within hours and then they switched to moderating comments. The second comment was of course not approved. Entrecard has made it obvious that they really do not care what the members think. I am not upset about my bounce rate at all and I actually find that the current system gives me a competitive edge because I feel like I have to really catch the droppers eye and keep them reading. I also worry that I will be deleting more spam comments. I agree with you Karen. I don't care about my bounce rate, and EC was a good source to get new readers, but they're really going to make it difficult. I'm waiting to see what they consider "interaction" but in the end if it makes life more difficult I will probably leave EC. I also feel they are doing this to keep from paying out the cash for credits. I requested a cash out 4 weeks ago and it's coming very very slowly in $10 increments (2 so far with 6 left unpaid), so I'm thinking they don't have the money to pay out. It's really a shame to see it decline in it's usefullness to bloggers. I've let them promote the paid ads on my blogs from the beginning but now I feel they have not kept up their end of the bargain. I agree with you. Graham cannot be happy unless he is trying to destroy Entrecard. The paid advertising came close, but not good enough, so he is trying this. I feel if people find something to interest them, they will stop and read the post. I feel it is wrong to try and force people to comment on something that may not interest them. You may be right, it might increase spam ( I never thought of that angle). Anyway, I feel the Entrecard is in its last months and I am already planning for that time. I agree with yours (and most people) that this has more to do with financial constraints than with bounce rates. It's not as if anyone has been complaining about bounce rates lately. It's yet another ill conceived , ill disguised plan by Graham. Last year I thought EC was going to be big, now I think EC is going to be one big failure. I've wondered about all the hype about the Acai berry. I'll look at these twice the next time I see them. Great question. On Saturday, the sample lady talked me into buying hummus with pine nuts. It was wonderful, if expensive. Won't buy it again, most likely, though, since it's not in the budget. Wouldn't mind finding a recipe, though. At Keeper of The Home I learned how to get rid of fruit flies: pour about a teaspoon of Pine-Sol in all her drains every day until they are gone. Then about once or twice a week after that. Also, she wipes her sink with it. Be sure not to run any water for about an hour after pouring it down the drains. Pine-Sol is also a disinfectant. 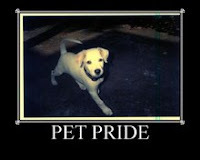 I came across a new blog called Pet Pride for pet owners. What's different about this one is that each week you get to leave a link to a post about your pet through Mr. Linky. A nice way to get a link to your blog and also find posts about others pets. I finally got around to getting a dog license for our new doggie, Abby. I found out the Drug Mart nearby has them so got it after work on Monday. UPDATED 7/11/09: She lost the tag in just 5 days along with the contact tag we made for her at PetSmart which she posted about on her blog: I Feel Naked! Command key and plus or minus. Read Tech Tips For The Basic Computer User for more great tips. According to the Ohio Lawyer--July/August 2009, three out of 10 Internet users visit Facebook every month! Do you? Just leave a yes or no comment and we can see if this statistic is true, but need you to participate either way. Please! If you'd like, share something you learned this week as well. Last time I went to GNC for my vitamin supplement, there was a dish of what looked like wrapped candy. It was Garden Greens AcaiBlast, a soft chew that tastes like a grape Starburst. Acai is a fruit from the Amazon Rainforest. These grape chews are rich in two of nature's most potent antioxidants that are supposed to be good for us. There are 300 mg of super concentrated Acai fruit per soft chew. The salesman told me it is good for the heart. I don't know about that, but it tasted good so I bought a bag. Have you ever tried these? What thing did a salesman get you to buy that you had no intention of buying when you entered the store? I like to use the suggestions on Amazon, they have quite a history on me by now, so their suggestions are usually pretty good. My favorite method was my neighbor who seemed to read every new book of value and would pass them all along to me when she was done. Too bad we don't live next door to each other any more. am sure you will have lots of fun meeting others out here! They always win Karen, always. Our dog loves to look out the window. She also likes to sleep when we go for long rides. I'll have to check out Abby's new blog. Oh, a car ride and a walk home, that's a great combination! I think Abby should get her way. Definitely! While Gerard and Abby were waiting for me to come to go to the park, Gerard was brushing Abby on the porch. I was doing a blog post and then went to eat my breakfast. I looked out, and Gerard and Abby were on the porch. A second later, I looked out and they were gone so I figured he took her for a walk. Wrong! 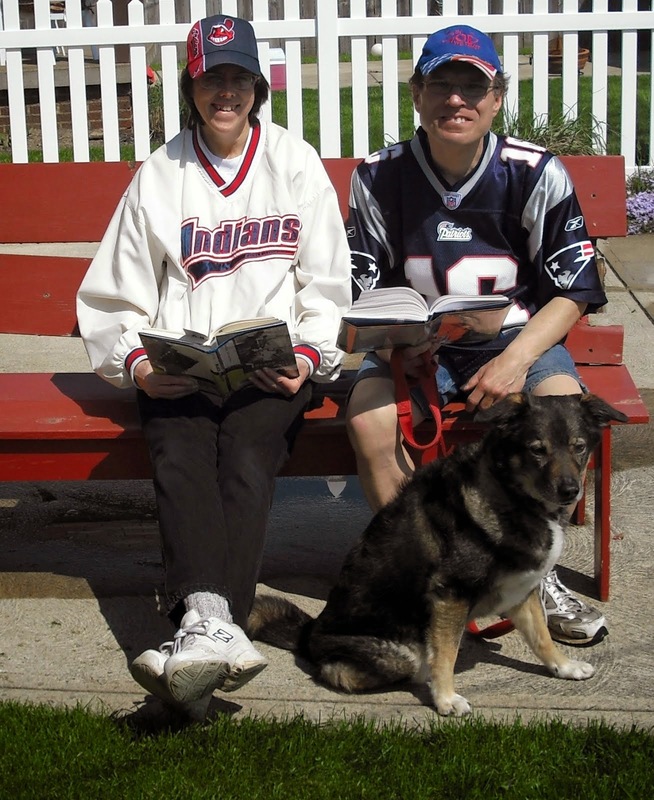 A dog walked by and Abby took off, pulling Gerard along as he took a tumble down the stairs scraping his knee. I missed the whole thing but about two minutes later, Gerard comes calling for me to come out. There he was with his knee all bloody and Abby in hand. He told me what happened and said the lady was calling the police (to make sure he was all right). Four police cars arrived in just a few minutes and all the neighbors were gawking. A couple of the policemen came inside to talk to Gerard and asked if our dog was friendly. Abby didn't even bark at the police and let them pet her nice. Gerard explained what happened and was just embarrassed. I was afraid they were going to take Abby away. They asked what kind of dog she was. It didn't seem to me like they asked any questions about how Gerard was. I noticed they looked at her dog tag too. What a way to start the day! I just wish I had gone out sooner and we could have been well on our way to the park. We still went and Abby had a great time barking at some squirrels and walking through the woods with us. Gerard said his knee didn't hurt, but it looked very bad. I tried wrapping it up and we had a first aid kit with some stuff to clean the scrape with which we used when we got back from the park. Then we went to play tennis. I tried taking it easy on him, really I did, but still won 6-1 and 6-2. I think because I was so well rested. We got back in time to watch the hot dog eating contest--very disgusting! Gerard didn't even get mad at Abby. He was mad at me because I didn't come when he called but my cell didn't even ring. He was upset with himself for not holding the leash tighter when he brushed her, but he said he didn't see the dog coming. I saw one of the neighbors across the street looking towards our house but figured he was just looking at our nice dog. Sorry, no video--it happened so quick and I was in shock. 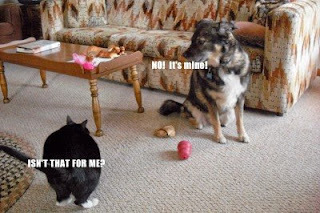 Did your pet ever embarrass you? Twice now I tried scheduling my post for July 7, "Sample Taste Makes A Sale At GNC" and both times it posted it to my blog! ARRGH! If you have a reader and follow my blog, sorry about that. It will be up Tuesday (if I remember that I saved it as a draft). Did anyone else run into this problem? I hope it gets fixed quick--I schedule my posts ahead all the time. While on Facebook, I was inviting some new friends to follow my blogs and noticed a list of related blogs that I started to visit. I found a very interesting one about Christianity by a Pastor that is called The Church Of No People. It is a pretty popular blog. I'm guessing because it has great posts that are funny and that make you think. I learned Abby loves the park. Here's a link to a video we took of our first time going there. Abby's Trip To The Park. I was so happy to see both our cats waiting for us like usual when we got home. 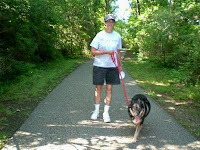 Of course, Abby put it on her blog too at Zemek's Updates (Abby-Woof, Woof section) and wrote all about it. Abby likes the treat called "Better Than Ears." It's a soft and chewy pig ear alternative that is 50% lower in fat than regular pig ears. She gobbled one up in less than a minute so I didn't even have time to get my camera to take her picture eating. These were the smoky bacon flavor. A co-worker got them for her. It was a very nice surprise for Abby. I have learned how to teach my dog some basic commands by reading How To Speak Dog by Sarah Whitehead. Abby catches on fast and does real well until distractions come (Gerard or other dogs). Ohio is the 17th state to adopt the law that if you drive with your windshield wipers on, you have to also turn on your headlights. Gerard finds his books through the newspaper or magazines, usually choosing new books or popular books. If he comes across a book he thinks looks interesting, he'll look it up on Amazon and read the reviews. If it has a lot of good reviews, then he'll try ordering it through the library. Sometimes, if he's waiting for the books he requested to come in, he'll browse the shelves at the library. I, however, use a variety of ways including just browsing shelves in the library, getting recommendations from Shelfari and Amazon, or coming across other authors promoting their books on the Internet.